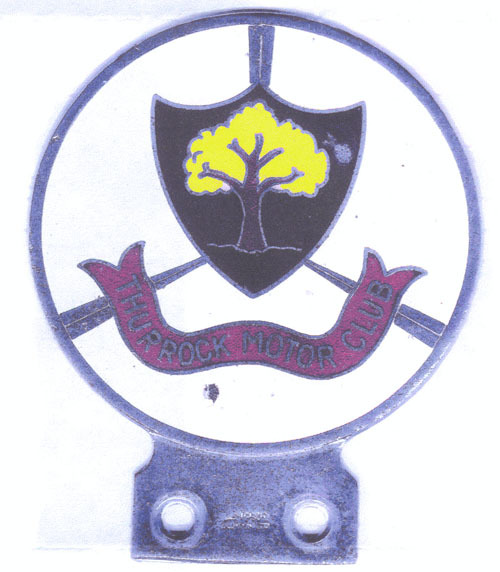 We were recently sent a picture of a Thurrock Motor Club car badge that had been found at a car boot sale. The outline and the spokes are chrome. The tree is presumably "Thor's Oak" - an image often associated with Thurrock based on an incorrect interpretation of the place name. We were asked whether we know anything about it and whether could we provide some more information? Well, no we didn't and couldn't. Does anyone out there recognise the badge or know anything about the club? Have you seen a badge like this before? Were you ever a member of the Thurrock Motor Club, or do you know someone who was? Professor Simon Holdaway from the University of Sheffield was able to help us out. "My father, Douglas Holdaway, was a member of Thurrock Motor Club. I cannot recall too much about it. Other members were Geog Player, who was a dentist in Grays, Laurie Bingham, who was manager of Joyes Departmental Store, Oscar Berkshire, who lived in Orsett, Ron Andrasey, owner of Daneshills Garage, which was a Ford agency, and a number of other people. The main activities were rallies around Essex. My father, who worked for Thurrock Council and lived in High Road, Orsett, drove a Morris Oxford and then a Triumph Mayflower. The club badge, together with those from the AA and South East Essex Motor Club were attached to a shining bar on the front of the car. One other thing I can recall is a day visit to Ron Joy (e? )'s house in, I think, Abingdon. He was the owner of the department store in Grays (over the railway lines out of town and turn first right opposite the church. The store was on the right if your back was to the church). It was a sunny day, the house and gardens were large enough for whole families to enjoy themselves, not least in the open air pool."